Wall Street’s supposedly elite group of stocks that have increased their annual payouts every year for at least a quarter-century – the “Dividend Aristocrats” – are peddled by advisers and pundits alike as supreme plays for income portfolios. And sure, a select few of them are. We’ll discuss two later today. The ProShares S&P 500 Dividend Aristocrats ETF (NOBL), which invests in the whole lot of dividend royalty, yields 1.9% as I write this. Even a million dollars parked in this fund is generating less than $20,000 in investment income annually. That sounds less like nobility, more like poverty! And while Aristocrat defenders might counter that their history of rising dividends indicates higher-quality stocks, you wouldn’t notice it in the returns. Since inception in 2013, NOBL has outperformed the market once in three full years of trading, and also is underperforming so far in 2017.
Dividend Aristocrats are deceptive. You can count on these companies not to crack, but that doesn’t mean they’ll fuel robust retirement returns. So let’s get into our two “dead money” aristocrats to sell. And I’ll then tell you where to reinvest in real royalty poised to outperform in the years ahead. So, the good news is, the yield on Target (TGT) shares is sitting near all-time highs. I think you can guess what the bad news is. And that dividend hasn’t been growing like it used to. 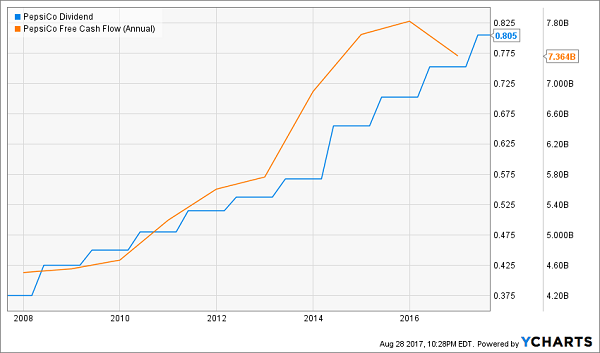 Five years ago, TGT was producing nearly 20% dividend growth, but its last payout hike – a 2-cent step higher – was a mere 3% bump! Target is caught between a rock and a hard place. Amazon.com (AMZN) and the rise of e-commerce are cutting into brick-and-mortar retailers across the board, but Target is being hit particularly hard because it’s simply not as competitive on price as Walmart (WMT) and the dollar-store operators. TGT has tried to fight back on the e-commerce side, but it has had to revamp and even scrap some initiatives, and generally isn’t seeing nearly the success that Walmart has with its slew of e-tailer buyouts. Meanwhile, Amazon has masterfully struck a balance between offering deep discounts without absorbing the low-cost retailer stigma of Walmart. The buyout of Whole Foods only emphasizes the socioeconomic class Amazon is targeting – those more likely to be Target customers. That push into groceries, by the way, should only serve to strangle TGT even more. If you’re looking for a Minnesota-based Dividend Aristocrat to buy, consider looking away from Minneapolis-based Target and toward the twin city of St. Paul, home of 3M (MMM). 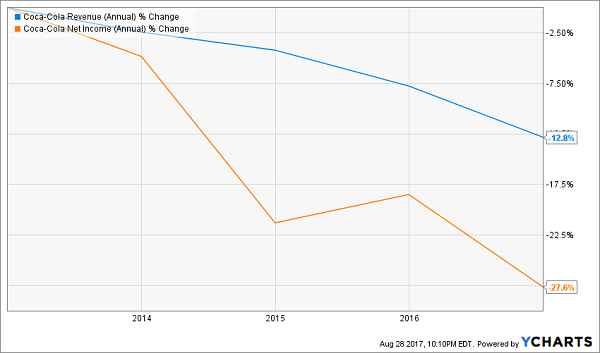 3M is the kind of company that comes to mind when you think about the security of a Dividend Aristocrat. It’s not just that MMM has juiced its annual payout regularly for nearly six decades – it’s the fact that 3M is so diversified that winning divisions can make up for a struggling segment or two. Here’s just a taste of 3M’s brands: Post-it Notes, Scotch Tape, Nexcare bandages and gauze, Thinsulate clothing insulation, stain repellent Scotchgard, Bondo putty (used for automotive body fillers, among other purposes), Roofing Granules, Velostat packaging material. 3M for years has been making adjustments that have resulted in a widening operating margin, so even amid a few years of stagnating revenue, it has been able to juice out higher profits. That’s also why forecasts for a return to even modest top-line growth for the next couple of years bode especially well. The industrial giant also delivered some promising news during its recent second-quarter earnings report, when it raised the low end of top- and bottom-line guidance for the full fiscal year. 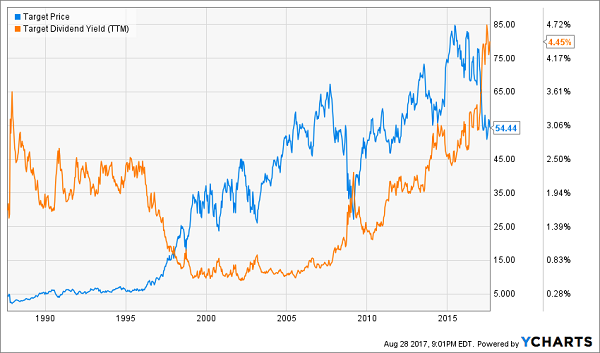 3M never boasts a particularly high current yield, but longtime investors can tell you that the company’s longtime payout growth has resulted in generous yields on cost … and its market-crushing performance over the decades is pretty nice, too. I recently laid out the business bear case for Coca-Cola (KO), which includes the company’s unfortunate placement in sugary drinks in a world that increasingly is going to war with sugary drinks. Today, I want to look at some numbers. 55: This is the number of consecutive years Coca-Cola has upped the ante on its annual payout. That’s good. 1%: Coca-Cola’s price appreciation since December 2014. 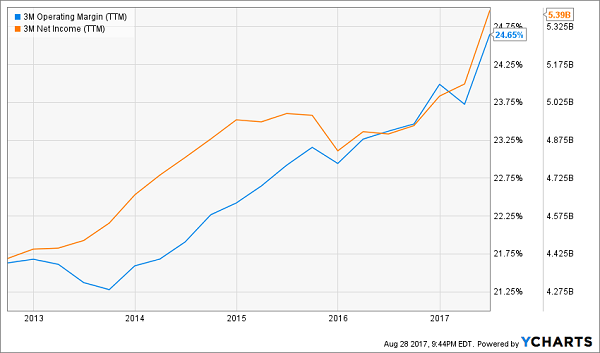 Mid-single-digit dividend growth isn’t horrible in a bubble, but when paired with a stock that’s essentially trading sideways, that’s a recipe for disaster. 23: Coca-Cola’s forward price-to-earnings ratio, which is on par with the likes of Alphabet (GOOGL) and Microsoft (MSFT). But Wall Street expects much better profit trends out of both those tech giants, plus the analyst community sees Coca-Cola’s top line shriveling by double digits in each of the next two years! 5: Coca-Cola’s multiple to sales. Yikes! Bottom line: KO is ugly, and there are so many ways to show it. While Coca-Cola looks washed up, rival PepsiCo (PEP) is in much better shape. Yes, Pepsi is suffering from the fact that its namesake product is in the crosshairs of an increasingly health-focused global population, to the point where city governments are pulling the same tricks it did on tobacco by looking to enact taxes on sugary drinks. But Pepsi is a much more diversified company that boasts snacks, too – including the Frito-Lay, Tostitos and Quaker Oats brands – making it more like a Mondelez International (MDLZ) than another Coca-Cola. Not to mention, like Coca-Cola, it has also diversified its beverage offerings to include Powerade sports drinks, AMP Energy drinks, Aquafina water, Lipton teas, Naked juices and Tazo teas. That isn’t to say PepsiCo is flawless. Its top and bottom lines have stagnated, but unlike Coca-Cola, PEP is working its way back to growth over the next couple of years, including high-single-digit profit expansion in 2018. It’s engineering that via smart pricing to offset lower volumes here in the U.S., while emphasizing smaller-portion-size packs (which tend to generate higher margins) in emerging markets. Combine PepsiCo’s potential for actual growth with slightly more favorable value metrics (21 P/E, 2.6 P/S), and you have a clear No. 1 between these two soda giants. The very best dividend stocks never show high yields because their prices keep rising in line with the increasing payments. Most people don’t realize this, but those of us who DO stand to profit handsomely and almost automatically! Step 1. You invest a set amount of money into one of these “hidden yield” stocks and immediately start getting regular returns on the order of 3%, 4% or maybe more. That alone is better than you can get from most conservative investments right now. Step 2. Over time, your dividend payments go up so you’re eventually earning 8%, 9% or 10% a year on your original investment. I’ve scoured thousands of stocks out there right now, looking for the very best companies that have both rising dividends and strong buyback programs in place. These are the kinds of stocks that could easily spin off annual total returns of 12%, 17%, even 25% or more … doubling your money in very short order. Right now, there are 7 in particular that I think you should consider buying.